This nativity set is culturally as well as geographically anonymous. Although made in Switzerland there is no telltale sign of a special tradition, cultural origin or geographical pattern. Unless anonymity itself could be considered a special tradition! Among contemporary artists crafting crèches there are some who avoid any contact with local customs and all too human faces. Their reasoning needs to be pondered for who knows how it really was? And there is more to be pondered. Who would be able to make the mystery visible with all these too familiar faces and customs? Verena Hirt's answer is that of the beauty of the form leading the viewer to the discovery of the mystery of Christmas. The figures with their anonymous faces and their half-open and windblown mantels play hide-and-seek with our imagination. Is God the hidden one? How much of him is revealed? The beautiful ceramic towers with their pointed domes and wide-open doors are an invitation to explore the mystery of this God who hides himself in a baby. For once anonymity leads into mystery not for lack of knowledge but rather because of an abundance of grace. 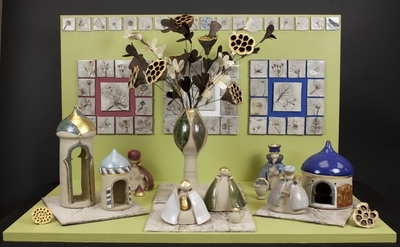 Set of glazed ceramic figurines created by Verena Hirt in Valais, Switzerland, depicting the nativity of Jesus. Exhibition label originally written by Fr. Johann G. Roten, S.M. for exhibit entitled "At The Manger"and held at Roesch Library, University of Dayton.